My partner and I have spent the last six months sleeping on a DreamCloud mattress. So we’ve had plenty of time to decide if it lives up to its growing reputation as one of the best luxury mattresses available. With 12 different layers, including gel memory foam, natural latex, and cashmere blend, it certainly looked impressive on paper. And the company behind it is clearly confident, offering a 365 night trial period. Choosing a mattress is a very subjective matter though. 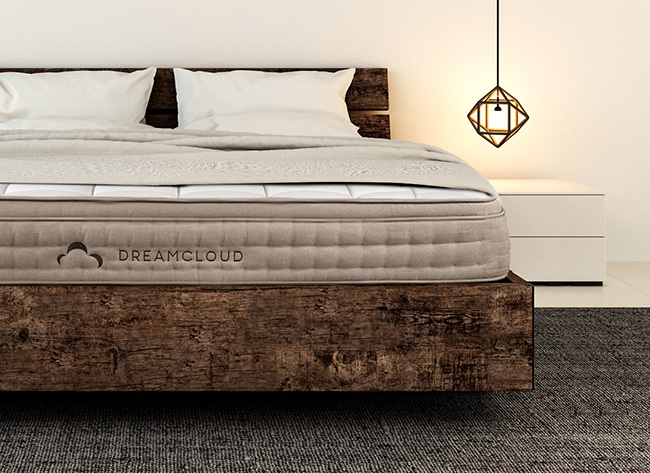 So in this review, I’ll describe what our personal sleeping preferences are to help you decide how suitable the DreamCloud might be for you. 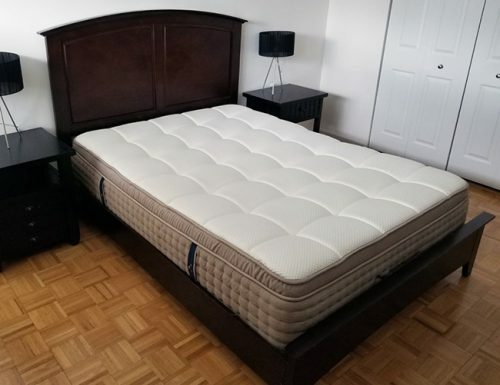 When sleeping alone or simply relaxing in bed together, we both loved the DreamCloud mattress. It has a good combination of medium firmness and luxurious padding, and we found it was comfortable in all sleeping positions. The only caveat is that since I’m very tall (193 cm) and personally prefer a very firm mattress, I found our combined weight (160 kg / 352 lbs) created a bit of a dip in the middle when we snuggled together. 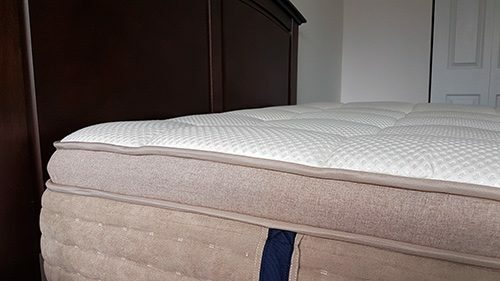 Who is the DreamCloud mattress best for? All body types who sleep alone. Back, stomach and side sleepers. If you and your partner don’t have a heavy combined weight and like medium firmness. 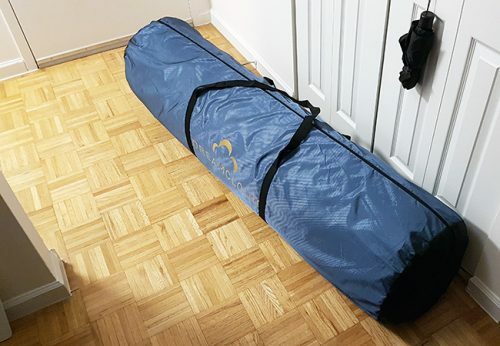 With free delivery, the mattress arrived in a compressed tube, inside a neat carry bag. They offer a white glove service, but we opted to unpack and set it up ourselves. Once we’d unrolled it, it took about an hour for the various memory foam layers to fully spring into shape. There was very little smell from off-gassing, but we left it for a day to be sure. And 24 hours later there was no noticeable smell at all. The mattress weighs a lot, so moving it onto the bed required a bit of muscle from two people – there are handles though, which always helps. It’s worth noting that it’s a towering 15 inches deep, so you might need to check that the overall height will work with your current bed base if you don’t plan on buying a new one. You can tell it’s a serious mattress right from the outset. The top cashmere layer feels beautifully soft to the touch. The stitching is perfect, and it just all around looks like it’s made with high-quality materials. 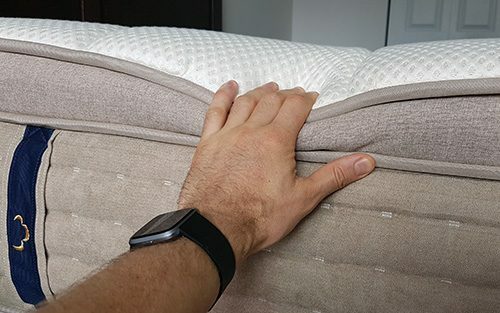 Pushing my hand into the top with all my weight immediately showed that it’s not the most firm mattress out there. It has plenty of give, though that’s to be expected with the multiple foam layers that make the top section above the coils. It’s a mattress that you definitely sink into in a satisfying way, and just feels comfortable from tip to toe of your body. Perhaps the word ‘cloud’ wasn’t an exaggeration after all. But it’s one thing just to lie down on a mattress to inspect it, and another to spend many nights trying to sleep on it. So the only test that really matters was still to come. One of the points that’s supposed to make the mattress special is the many different support layers before you even get to the internal coil system. With a gel infused memory foam layer, a natural latex layer, and three more foam layers, you should feel cushioned and supported. And then the 20 cm 5 zone pocket spring layer below does the rest to ensure your body is held nicely in place. Although you can’t actually tell that you have multiple layers under you, you can tell that your body both sinks in comfortably and feels supported. 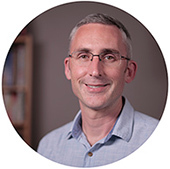 We found that we could sleep on our front, back or side, and still feel adequately supported, with no obvious pressure in any part of the body. My partner fell in love with the mattress the first night, and slept very well that first week. I also slept pretty well, especially since I sometimes have difficulty sharing a bed, and we tend to sleep in separate beds at times. However, I also suffer from recurring back pain, so I’m very vigilant of the type of mattress I sleep on. And I could feel that our combined weight of 160 kg / 352 lbs was creating a dip in the middle of the bed when we slept closely together. It didn’t cause me so much concern when we slept with a little space between us. 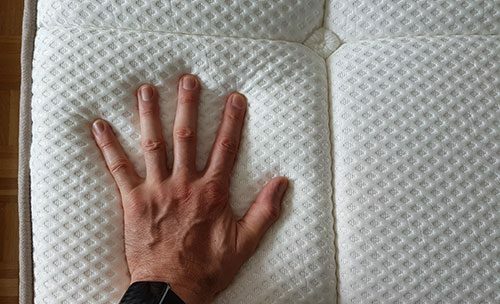 But it did make me wonder if the medium firmness was going to be an issue for me as time went by, considering I tend to do better with firm mattresses. My partner still loves the mattress 6 months later. She claims it’s the best mattress she’s ever slept on. I’m not so convinced myself though – at least not when we share the bed! When we sleep separately, which we regularly do because of my sleep problems, I can sleep very well on the DreamCloud. So much so, that we have a friendly ‘discussion’ about who sleeps in which bedroom on those nights! We both prefer it to our previous memory foam mattress – there’s no doubt there. But sleeping together is an issue for me on this mattress. That dip in the middle under my large weight doesn’t go well with my tendency to sleep on my front. It just makes me feel like my back isn’t quite as supported as I’d like it to be. When we do choose to sleep together, we’ve found it’s better to leave some space between us. And for that to work, especially on the queen size, we need the side supports to hold up. The manufacturer says they are ‘reinforced sides’. And although they aren’t the firmest of sides I’ve seen, they do enough to keep us in place on the edge without feeling like we’re going to roll off. So I’m happy about that aspect overall. Nowadays, it’s common for mattress companies to claim that it provides some cooling effect. This is often related to using gel infused memory foam, or having some clever ventilation system, i.e. air gaps. The reality in my experience is that the best they can do is not be as bad as standard dense memory foam. At the end of the day, they rarely provide real cooling, as your body heat still remains mostly trapped between you and the bed. I didn’t find the DreamCloud had a particular problem with overheating, which is good. But I didn’t notice anything exceptional about the temperature regulation when sleeping on it in the muggy New York summer of 2018. You’ll still need air con or a fan. Known in our house as ‘are you going to wake up every time I come back from the bathroom and grumble at me’, motion transference can make or break a mattress. The DreamCloud is pretty good in this department, thanks to all those pocketed coils, which is apparently a new patent-pending system. It naturally doesn’t absorb as much motion as a deep latex mattress. But compared to most memory foam and standard mattresses we’ve used, it does a good enough job of isolating your partner’s movement. One of the main causes of our choice to sleep in separate beds at times is disturbance because of movement. And we did find it reduced this problem compared to our previous memory foam mattress. When you turn the lights down and the soft music on, you don’t want squeaky or wobbly coils, or that ‘stuck in the mud’ feeling that many mattresses give. I won’t go into detail here, other than to say if you want to use your mattress for intimacy with your partner, the DreamCloud has got your back. If my partner were writing this review, she’d tell you the only potential problem is sharing the mattress with a fussy sleeper like me! In all seriousness, I think our particular case demonstrates how mattress choice is such a subjective thing. Don’t get me wrong – I was very impressed with the overall quality of the DreamCloud. And when I sleep alone on it, I usually sleep very well, and wake up feeling rested. The only problem is the combination of my notoriously bad back, our combined weight and the density. I just like a firmer mattress at the end of the day. If I had to put a number on the firmness, I’d give it a 6.5 or 7, when I need 8+. So my overall verdict is that for the right kind of person, this will be an excellent mattress for many years. And if you’re looking for something in the middle in terms of firmness, then I’d have no hesitation in recommending the DreamCloud.